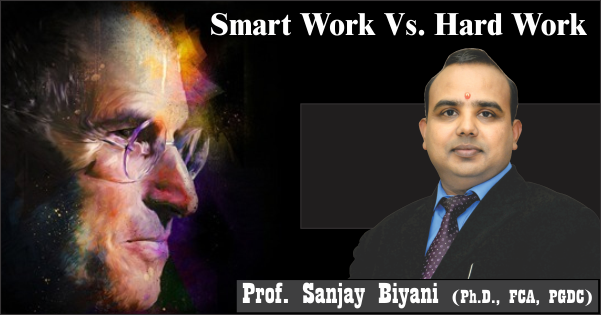 Who according to you is a smart worker and is a hard worker? The work that we enjoy doing actually is smart work and if one is doing what has been directed by others is hard work. Hence enjoyment factor somehow makes a clear differentiation between smart and hard work. Why it is important to enjoy work? If we segregate enjoyment from work then enjoyment will be for specified time period but if we enjoy our work we can enjoy every time. It is just like if one enjoy cricket then can play effectively anytime but if one doesn’t like cricket then playing becomes a compulsive task for him. Actually enjoying our work is actually living our life in true sense. Therefore, if one wants to do smart work then they have to enjoy their work. Then they won’t feel exhausted; never realize time and effort that we deliver for any work. We get tired and exhausted because we follow what others tell us to do but we really enjoy doing what we never tired. Have you ever seen any hardworking person who worked really very hard but didn’t succeed and on the other hand a smart worker who accomplished his goal very quickly and easily? It’s a fact that in any institution or organization like hospitals, judiciary, educational institutions etc. hardly 20-30% people enjoy their work. They all are performing their duties, which are actually prescribed others. But responsibilities are performed by heart and people taking responsibilities enjoy their work. By doing what other wants us to do give a feeling of slave on the other hand by taking responsibilities one gets the feel of a master. Steve Job and Bill Gates etc. have never considered time while doing work because they enjoyed their work. Even Hitler also enjoyed his work. Therefore, if one wants to do smart work one has to find out do they really want to do it and does it actually gives them the feel of enjoyment. There has been a belief that hard workers are those who put their complete effort to accomplish their target and smart workers are those who try to finish task by opting shortcuts. Is this belief true or false? Actually people have an incorrect understanding of the meaning of smart work. They think that smart work is related to external show off and shortcuts. But actually smart work is related to one’s passion and interest basically. If one is passionately interested in doing their work and also enjoy doing the same then they will give their best. And hence during that they put a lot of hard work to accomplish their work without giving second thought to time and effort. On the other hand some people keep doing hard work but never get success which leads to the development of undesirable inferiority complexes in them and so they start trusting luck factor and believing any other person rather than trusting their own self. 2. Change your profession according to your career interests, passion and priority, if you have courage to do the same. Does upbringing and environment play a vital role in determining traits of smart or hard workers? Definitely upbringing and environment plays a vital role in determining traits of smart or hard workers. As our society frames our beliefs, we start following them and ultimately blocking our thinking power. I think parents should not restrict their children with their own fears and beliefs. All parents should boost their wards with positive words like, “you can”. Such words will strengthen children’s belief and confidence. Therefore along with enjoyment, firm and positive belief are also very important for becoming smart and successful worker.